I'm sure we all have them: teachers who loom large in our memory, long after the classes are over, and we have made our ways in the world, and you'd think that the days of chalk boards and dreary afternoons and tests were a thing of the past. Yet every now and then I find myself thinking of teachers who made a difference, and four names come crowding to the forefront of my memory. First off is Mrs. Martin, my grade one teacher at Harry Eburne Elementary (long since closed) in Richmond, B.C. Every student should have a grade one teacher as wise, warm, and kind as Mrs. Martin, who followed my progress through the school even after I left her class, and who must have seen something in me that wasn't apparent when I was six, because she presented me, before I left the school three years later, with a hardback copy of Madeline l'Engle's A Wrinkle in Time. It was, in retrospect, not necessarily a book you'd give to a nine-year-old, but it was a good choice, because I loved the book, and it opened up a whole new world of reading that wasn't even hinted at in the Nancy Drew titles I was then reading. Next there is Mr. Hehn - first name Robert, I think, but I can't be sure - who was my grade five teacher at Hillcrest Elementary School in Victoria. He had a passion for English, and for language, and I will be forever in his debt because it was he who introduced me to Norton Juster's wondrous The Phantom Tollbooth, reading it to our class over a succession of afternoons, clearly delighting in the wordplay and the humour. He encouraged me to write a radio play for presentation to the class, the screenplay based on my then favourite TV show, Voyage to the Bottom of the Sea. The text of this play is now (perhaps mercifully) lost forever, but it was the first time a teacher had encouraged me to write something just because I wanted to, not because it was part of the class and would be marked. It was also Mr. Hehn who was responsible for our class doing a radio version of Conan Doyle's 'The Red-Headed League', and who promoted me to the part of Holmes when the girl originally cast in the part developed cold feet. Even though it was to be another two years before this particular seed took root, I trace my awareness of the Holmes stories back to my grade five year. When I moved to Ottawa the next year he wrote to me, several times, and while the letters are now lost, I well recall the delight of receiving them. Thank you. Then there is Norm Claridge, my grade 9 and 10 Biology teacher at Hugh Boyd Junior Secondary School in Richmond. A less likely sciences student than me would be hard to find; but such was Mr. Claridge's passion for the subject, and his sense of humour, that he made even me fall in love with the subject matter, and understand it (the fact that he was wont to wander around the class with an iguana on his shoulder appealed to me; even then I appreciated the absurd). I spent many a happy lunch hour in his classroom, looking after the gerbils and snakes (not at the same time, of course), and to this day the smell of formaldehyde brings back happy memories. In addition to teaching the finer points of biology, he also instilled in his students the need for precision and detail, all of it conveyed with humour and passion. When I learned of his too-early death a few years ago I felt sorry for the students who would never have a chance to encounter his teaching, and was grateful that I'd known him. Last - but certainly not least - is Mr. Harvey; Poona to those students brave enough to address him thus (he served in the British Army in Poona, India during World War II). He taught Literature at Steveston Senior Secondary School in Richmond during my grade 11 and 12 years, and I was more than happy to take the course, an elective: the students in it either had a burning passion for English Literature or were there because all the other courses for that block were full, and this was the only option. Poona introduced me to many of the delights of English literature, from the established classics (Shakespeare, the Cavalier poets, the Romantics) to less obvious highlights, such as the ghost fiction of A. J. Alan (he read us 'The Dream' and '17.45' during class; he was probably just about old enough to remember hearing them broadcast on the BBC in the late 1920s). He also encouraged me to go outside the box in my essays, cheerfully agreeing to let me write about, say, English detective/mystery fiction. In 1981 I was able to go to England as part of a school trip, and Mr. Harvey was one of the guides. It was my first visit to England, and I was thrilled to be there; even more thrilled when, a few nights into the visit, Mr. Harvey took me and my friend Liz to see J. B. Priestley's play Dangerous Corners. In the interval he took us to the bar for drinks - I ordered a brandy, because I couldn't think what else to order (I was only 17, after all, and my knowledge of drinking came from movies and TV) - and then when the play was over he hailed a taxi outside the theatre and took us to Fortnum's Fountain for a late dinner: Welsh rarebit, tea, and chestnut meringues. It doesn't sound like much, but the surroundings, the elegance of the service, and the fact that it was so late in the evening all combined to make it a wonderful end to a truly magical night. These days, I suppose, a male teacher taking two teenage female students to the theatre and then dinner - unchaperoned - would be little short of a scandal; at the very least, the teacher would be censured for lack of judgement. The record must state that Mr. Harvey was a perfect gentleman; if there was a hidden agenda to the evening then it remains so well and truly hidden that, almost thirty years later, I can't discern it. And I can't help feeling sorry for students who would be deprived of such a treat because - well, because it doesn't look right, or could be open to misinterpretation. That evening stands out as one of the best and most memorable in my life, and I thank Mr. Harvey for it. Looking back over what I've written, I see that while all four of these individuals were fine teachers, so much of what I remember them for and what inspired me has little to do with the actual nuts and bolts of daily classroom life, and a good deal to do with them going above and beyond to identify my strengths, encourage me in my interests, and in so doing help me to become the person I am today. I was fortunate to have four such teachers, evenly spread throughout my school life; I can only hope that every student has at least one Mrs. Martin, Mr. Hehn, Mr. Claridge, or Poona, to inspire and guide them. I was a bit late coming to the international phenomenon which is Alexander McCall Smith's 'No. 1 Ladies' De tective Agency' series of novels; it began in 1998, with the publication of the eponymous novel, and I know that I registered the enthusiasm which greeted the first book and its two or three subsequent installments; so much so that when, on a trip to Vancouver, I saw that the first four titles were available at Book Warehouse on Granville Street I bought them. When I got home they disappeared onto my ever-increasing 'to be read' pile—which truth in advertising laws compel me to admit is really a bookcase—and there they stayed. Every now and then I would, in my quest for the next volume to read, allow my hand to hover over the first book; but then another title would clamour for attention, and I would pass on. That changed in August 2006, when we took our usual trip to Nimpo Lake in the Chilcotin region of British Columbia. We've made the trek there every year for the last six or seven years, staying at Stewart's Lodge, a fishing resort on the shore of the lake. 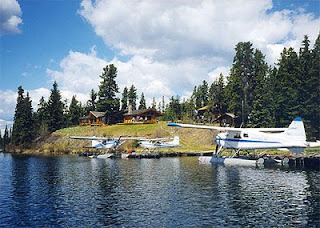 Most of the people who come to the area are serious fishermen, and the area is renowned for its fly-fishing; Nimpo Lake is said to be the float plane capital of the province, and every day there are dozens of flights in and out, ferrying people to outpost cabins on even more remote lakes that are only accessible by air. We do the odd bit of fishing, for the sake of appearance more than anything else, but for the most part we go there for peace and quiet, of which there is an abundance: no phone, no computer, no TV, no fax, just the cry of the loons, the crackle of the wood fire, and the chance to sit and read. Every year Christopher and I each pack a box of books to Nimpo, taking far more than we can possibly read in the time allotted (typically ten days), but working on the basis that it's better to take too much than too little, especially when the lodge library offers little more than some Reader's Digest condensed novels and back issues of Field and Stream, and the nearest library or bookstore is several hours' drive away. In 2006 Smith's The No. 1 Ladies' Detective Agency was in my box of books, and after reading Andrew Greig's autobiographical Preferred Lies and Patricia Carlon's intense thriller The Running Woman, I was in the mood for something lighter. And thus it was that my hand fell on Smith's book, and this time it stayed, and I settled down to make the acquaintance of Mma Precious Ramotswe, the No. 1—indeed only—Lady Detective in Botswana. Three hours later I emerged from the book, blinking into the early afternoon sunlight , vaguely surprised to find myself in the heart of British Columbia's back country. Smith had plunged me so immediately, so deeply, into the Botswana setting that it took me a few moments to realise that I was not in Gaborone (pronounced, I later found, Ha-bore-oh-nay) or the surrounding countryside. His was a fully realised world; and he was able to convey effortlessly—or so it seemed—the sights, the sounds, the smells, the life of a country about which I had previously known nothing. Smith was born in what is now Zimbabwe, but was then Rhodesia, and his love of Africa, and its people, rang true and clear on every page. Nowhere is this more true than in the person of Mma Ramotswe herself (Mma—pronounced 'Mm-ah'—is a formal term of greeting or respect for a Batswana woman; for men the term is Rra, pronounced with a rolling 'r' and soft 'a'). Her father, Obed Ramotswe, has died (or is late, as a Batswana would say), and his daughter is now left to make her way in the world. Her father has left her a valuable herd of cattle—cows being a highly prized symbol of wealth and prosperity in Botswana—and Precious sells some of the cattle in order to start a new life in the capital city of Gaborone, where she decides to become the country's first, and only, lady detective. She takes Agatha Christie as an inspiration, sets up her shingle, hires a secretary (the formidable Mma Grace Makutsi, who is immensely proud of the fact that she graduated with 97%—the highest score ever—from the Botswana Secretarial College), and begins detecting. As soon as I finished the book, I kicked myself that I hadn't brought the other titles that I had in the series with me, so impatient was I to read more about Mma Ramotswe and her world. Is there anything more frustrating to a book lover than knowing there are books you have and want to read, but can't get at? No matter; as soon as we got home I read the next three in quick succession, got myself up to date with the series at the first possible opportunity, and now buy each book as soon as it comes out. Yes, they're that addictive; and that good. I should warn readers that anyone expecting traditional mysteries with lots of clues and red herrings, or action-packed adventures, may be disappointed. The No. 1 Ladies' Detective Agency novels are 'mysteries' in the same way that Jane Austen's books could be called 'romance novels'. Mysteries there are aplenty, but they are generally low-key affairs; Smith is more interested in his characters—what makes t hem tick, how they relate to others and to the world around them—and in the changing face of Botswana, a country that has, better than many other African nations, weathered the storm of independence and the modern world, but which faces problems of its own; the devastation wrought by AIDS is often referred to, with Smith depicting families torn apart by the disease, yet admiring the quiet courage and love of the many women who have taken in nieces, nephews, and grandchildren and raised them as their own. And in Mma Ramotswe he has created a truly wonderful character, someone who is wise and kind, knowing and just, but who has endured violence and heartache, anger and pain. She also has a sense of humour—and an appreciation of the ridiculous—which often comes to her rescue; a large woman, she prefers to describe herself as 'traditionally built', and frequently decries the tendency amongst young Batswana women to try to emulate Western fashion and starve themselves into an (in her eyes) unnatural, and un-African, thinness. When I heard that the BBC was making a film of the first novel I was somewhat worried; but to my surprise and delight, the film of The No. 1 Ladies' Detective Agency was perfect in every way (the fact that the l ate Anthony Minghella co-wrote and directed the film should have told me that it would be good, if not great). Jill Scott and Anika Noni Rose were perfectly cast as Mma Ramotswe and Mma Makutsi respectively—I would never have guessed they were American, so good were their accents—and the supporting cast were uniformly excellent. Even better, in some ways, was to be able to see, at last, Botswana and its people, in all their colour and beauty. A six-part series, starring the same actors, has just premiered in Britain on the BBC, and debuts in North America on HBO starting on 29 March; I've seen the first episode, and it's every bit as good as the film. Lucian Msamati is excellent as Mr. J.L.B. Matekoni, proprietor of Tlokweng Road Speedy Motors and Mma Ramotswe's good friend; I can only hope that another wonderful recurring character in the book, Mma Silvia Potokwane, head of the children's home outside Gaborone, appears in the series. 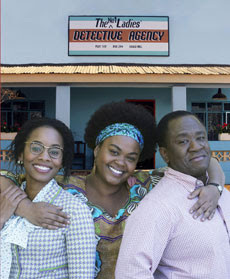 The picture shows (left to right) Anika Noni Rose, Jill Scott, and Lucian Msamati in the film. 'What does this have to do with ghost stories, or writing?' I hear you cry. Absolutely nothing. But in a world where the trivial and the ephemeral are esteemed and celebrated, where loud and vulgar trumps quiet and thoughtful, I wanted to call attention to the quiet and thoughtful. We need more of that in the world; and Alexander McCall Smith has given it to us. Many thanks, Mr. Smith. I've had a couple of people—who aren't even related to me—ask recently if I was going to be posting something to my blog soon, which is gratifying, even as it made me realise that I really didn't know what to write about, specifically ('Calls herself a writer,' I hear you grumble). The truth is that while I did manage to write a daily diary entry every day for more years than I care to remember, most of what goes into a diary isn't (be honest) what the world at large wants to read about ('Got up; v. cold this morning. Bertie brought me two cat toys and a napkin during the night. Cute. Five minutes scraping the ice off the van; why can't someone invent an ice scraper that actually works? Four more story submissions by e-mail today, one from someone who ignored the guidelines about sending an attachment, and pasted it into the e-mail. How does someone expect to be taken seriously as a writer when he can't follow a simple instruction? Coffee grinder seems to have packed it in; back to the old one. Thank goodness I didn't throw it away.' etc., etc.). On the writing front, I've finished proofing my collection Northwest Passages, which is on target to be published this October by Prime Books. It was a rather odd experience, to sit down and read ten of my stories back to back; I noticed certain preoccupations and themes emerging in a way that they don't when you consider a story in isolation. However, I'm pleased with the diversity of the tales, and think that they hang together as a whole, and was pleasantly surprised to find that the two new stories—'Out and Back' and 'After'—stand up well with the others. 'Out and Back' was inspired by a website that was brought to my attention by my cousin Sean Lavery, who sends me links to weird and wonderful websites. One was to an abandoned amusement park—Chippewa Lake Park—in Ohio, and the pictures on the site immediately sparked my imagination. The park ran for a century, between 1878 and 1978; it was abandoned that year, and the midway rides were left in situ to rot away. Some time ago on this blog I wrote about the Pacific National Exhibition ('All the Fun of the Fair') and my annual trip there, as a child, with my father and brother. I loved the PNE, and to see a fun fair left the way Chippewa Park was left tore at my heart, and I knew I had to write about it somehow. Click here to see the pictures that inspired the story (scroll down for the pictures, and click on them to enlarge). Sadly, I saw on another site that some of the buildings—notably the Coaster station and the Bumper Cars building—have deteriorated even further, and the Bumper Cars building has now collapsed completely. The other new story in the collection, 'After', is inspired by the Kent murder case of 1860, which shocked and fascinated Victorian England in equal measures: shocked because of the age of the victim and the ferocity of the crime (Francis Saville Kent, not quite four, was found dead with his throat cut, so viciously that the head was nearly severed from the body), and fascinated because the murder remained unsolved for five years, during which time the details of Kent household—which would be called dysfunctional today—were laid bare for all to see. I was familiar with the main facts of the Kent case because of the influence it had on Victorian detective fiction (Wilkie Collins, Charles Dickens, and Mary Elizabeth Braddon all drew on details of the case in their fiction), but last summer read Kate Summerscale's The Suspicions of Mr. Whicher, a book-length study of the case (which subsequently won the prestigious Samuel Johnson Award for non-fiction). Summerscale quotes extensively from a number of contemporary documents, and two statements attributed to Francis's half-sister Constance, sixteen at the time of the murder, intrigued me, as did the character of Constance herself. It was, in many ways, a very enjoyable story to write, told as it is in very Victorian language, yet owing a tremendous debt to James Hogg's wonderful The Private Memoirs and Confessions of a Justified Sinner, a favourite novel of mine. I wrote it during two very hot weeks in July of 2008, and in the course of researching what the church service would have been the Sunday before the murder—these things are very carefully laid out in The Book of Common Prayer—I came across a fact which, to my mind, has tremendous bearing on the events of a week later, but which has not, so far as I know, been commented on before. It was a hot Saturday morning when I stumbled on this discovery, and I confess I shivered when the full implications of it sank in. If you want to know more, you shall have to read the story. . . . I have a few irons in the fire, story-wise; the only other news to report is that my story 'Endless Night', which first appeared in Exotic Gothic 2 (and which will be in Northwest Passages), has been chosen for inclusion in By Blood We Live, a reprint anthology of vampire stories being published by Night Shade Books in August 2009. I sent the story off for consideration last July, and it was a very pleasant surprise to get the good news from John Joseph Adams yesterday. I recently wrote an introduction to The Light of the World and Other Stories by Peter Bell, to be published later this year by Ex Occidente Press. We've been very pleased to publish several of Peter's fine tales over the years, and I was honoured when he asked me to write the introduction for his first collection. Anyone who enjoys suspenseful, elegant, and assured tales of the supernatural in which the tension builds gradually but inexorably will want to get a copy of Peter's book. Last but not least, Christopher and I have finished our introduction to a new Barnes & Noble reprint of the complete Sherlock Holmes stories by Arthur Conan Doyle. Tag team writing is an interesting sport; not for everyone, I suspect, but we've come up with a system that works for us, and it was enjoyable to be immersed once more in that world where it is always 1895, and the game is perpetually afoot. Would that our own world were so captivating.